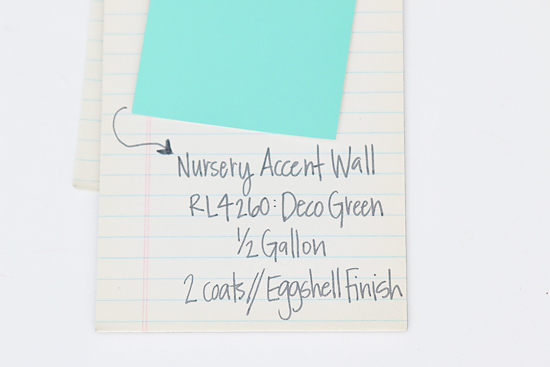 I really needed today's paint color organization tips, and will be using them as we freshen up our laundry room (which is where all of our paint is stored). I have always been a color lover and our home reflects that; whether it is through a painted piece of furniture, our brightly painted front door or the walls throughout. The number of touch-up jars and colors that I try to keep track of is a little insane. Even if you have a simple and serene color palette for your home, most likely you have a variety of colors, shades and finishes in each of your spaces. So how do you keep track of it all? I have tried a few methods, and none have really stuck all that well. 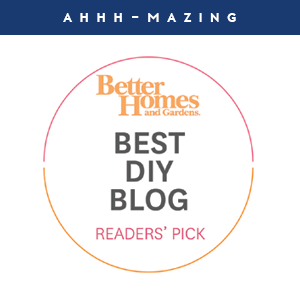 I actually find myself googling my own blog when I am at home improvement stores, which is a nice option, but not always reliable if I have left out any details. 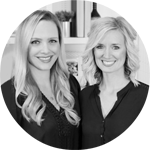 That said, the gals from DIY Playbook are here today to share a few different options, all of which are quick, easy and inexpensive (even free) to do! Thanks for the ideas and the push ladies! When it comes to home decorating, we've found that one of the HARDEST decisions starts right at the very beginning. What color do I paint the walls? 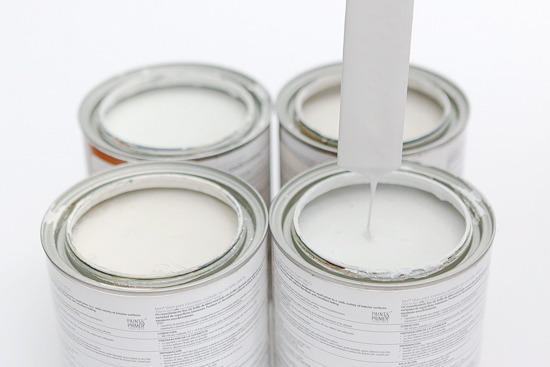 When you have thousands of paint colors to choose from, it can be incredibly overwhelming! Trust us, we we've been there before. But today, we're not going to chat about choosing the perfect paint color (we've already blogged about that topic). 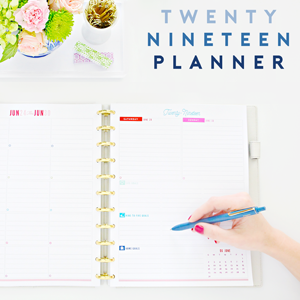 Instead, we're going to chat about what you do after you choose the color & paint the walls. How do you make sure that you never ever forget the name of the winning colors that you painted throughout your home? Because you put so much time and thought into choosing the absolute perfect color, we want to make sure that you have that paint color information on-hand and organized! 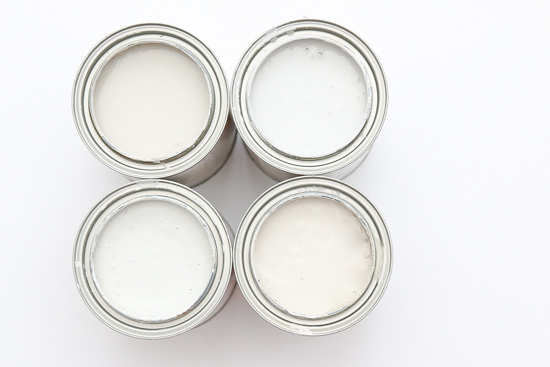 That way you can easily buy new paint for touch-ups, or know the exact color number & sheen when you want to add a color to a new room in your house. 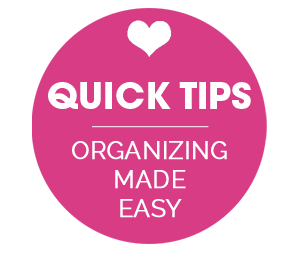 So let's dive right into the 4 different options we created to save and organize this crucial information. I recently painted our new guest room (full room reveal here) a very dark & moody navy color (Valspar's "Dutch Licorice" to be exact). I was incredibly nervous to bring such a dramatic color into our bright home, but I'm happy I stepped outside of the box and tried something new. Because I love this color so much, I want to make sure I never forget the paint information. It is on the back of the light switch cover! Pretty clever, right? I simply used a flathead screwdriver to take the outlet cover off. Then I grabbed a sharpie and wrote the information on the back of this valuable real estate. I included the brand, color, paint color number, and finish directly onto the switch cover plate. Rookie Tip: If you're adding this information while you're painting the space, add a small thumb print of paint on the back. That way you can always bring the cover plate switch with you to the store if you need them to match it for any reason. Once all of the vital info was recorded, I screwed it back on and called it a day! Now if I ever have to buy more paint for touch-ups, I will know exactly which color to buy (and so do any future home owners). 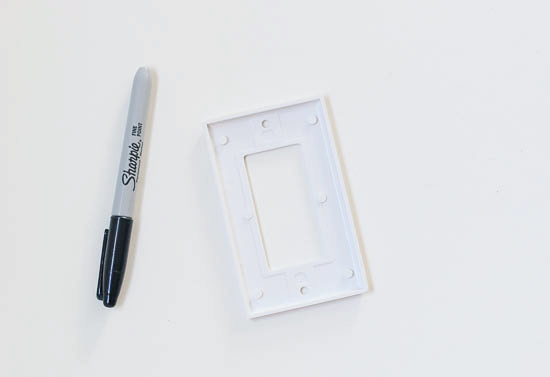 This next idea is a great resource for those of you who may prefer to have a tangible item you can physically pick-up, refer back to, or even bring to the hardware store as a reference. We love the paint stick library because it's almost free to create, takes up next to no space to store, yet it is a wealth of information to have on hand for the long-term! So let's first talk about the cost of this DIY project. 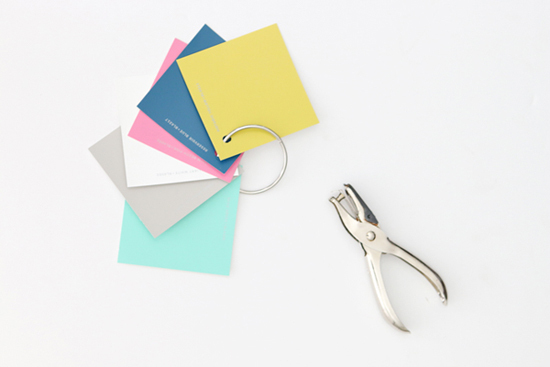 Since paint sticks are free at hardware stores, the only expense (outside of the paint of course) is the binder ring, which costs about $2-5 for a whole package online or at an office supply store. 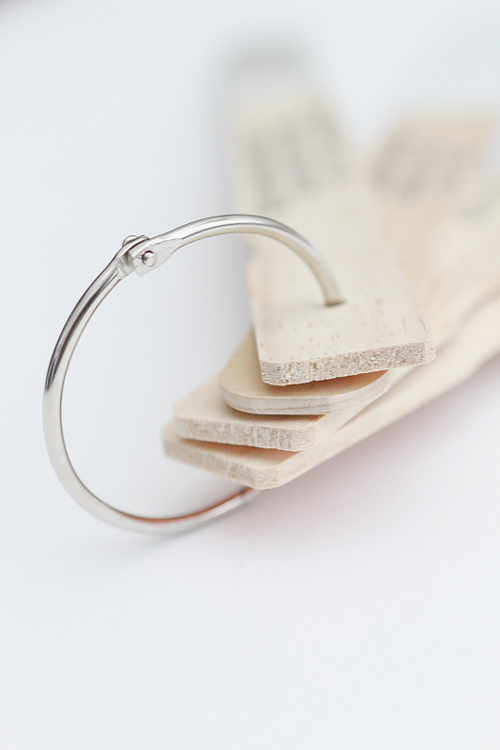 And having a whole package of these rings in the house is super valuable because they tend to be useful in organizing just about anything (like these super easy Christmas Card books we put together each year). 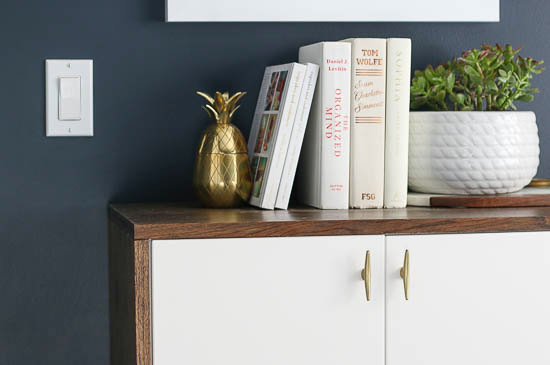 To get started on this project, you're going to want to pick up one free paint stick for each paint color you'll be documenting... and if the hardware store doesn't mind, maybe grab a few extra for future paint colors you may want to add to your collection someday. 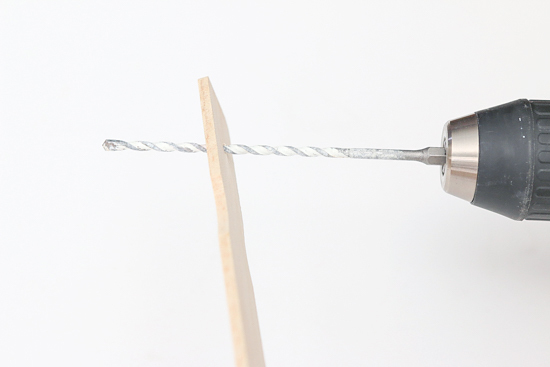 Using a drill and a pilot bit, drill a tiny pilot hole at the very top of each of your paint sticks, being careful not to break the paint stick in the process of drilling each hole. 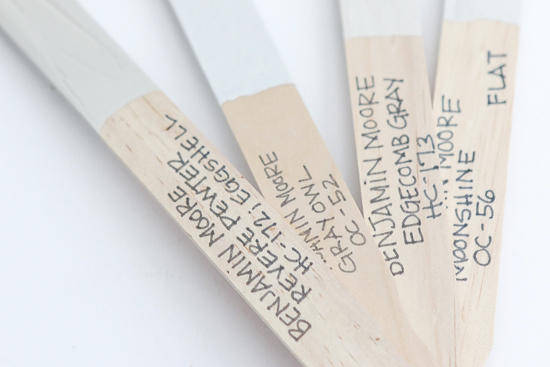 Once you have a pilot hole at the top of each paint stick, it's pretty much business as usual for these sticks. 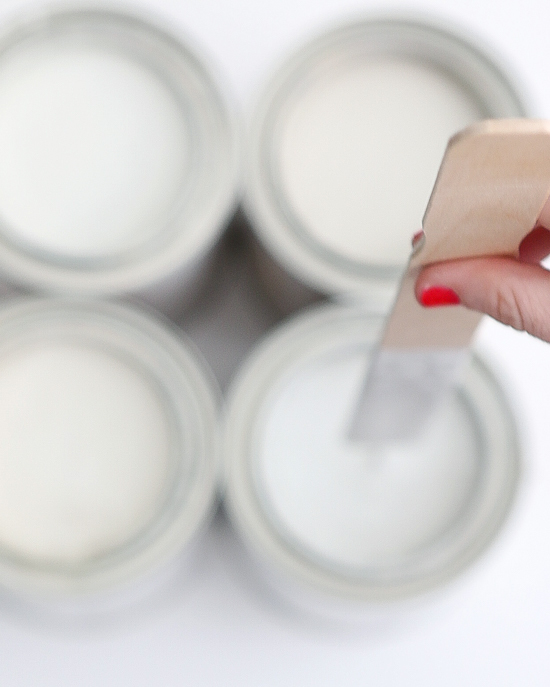 You should use each stick to stir the paint cans like you normally would, but instead of throwing that stick in the garbage when you're done with it, you're going to save it & set it on the top of the can's lid until the paint is dry. 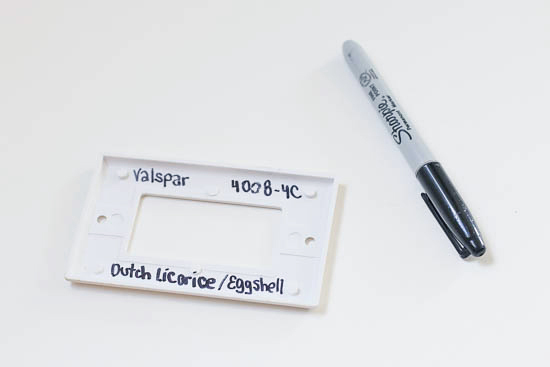 Once the paint is dry, use a marker to write down the paint's information. 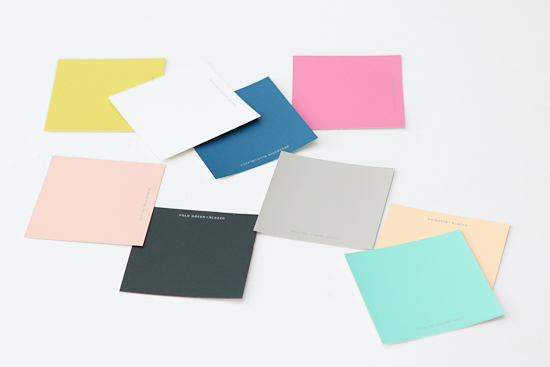 We included the paint brand, the name of the color, the number of that color, and the sheen. However, we don't necessarily think that's the only important information that can be noted. You can also include other important details such as how many coats it took to cover the wall with this paint, what room this paint was used in, how much paint you have leftover after the project, and even where you are storing that extra paint. 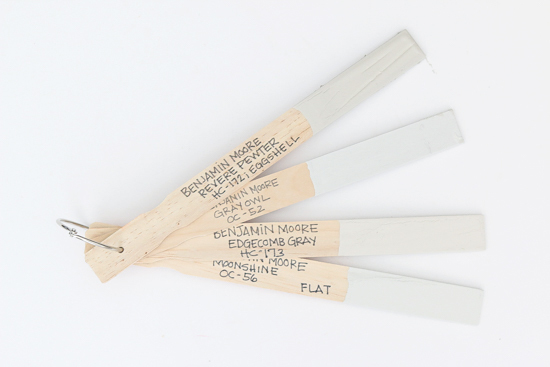 Heck... if you have a memory like me, there is no such thing as documenting too many details on these paint sticks! Rookie Tip: Use the back of the paint sticks if you need more room to write necessary information! 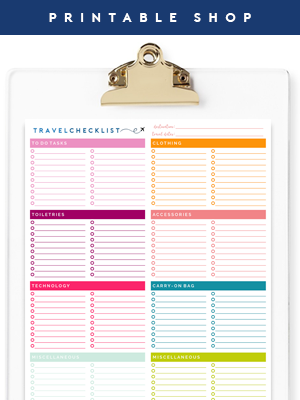 After you've documented all of the information you want on the paint stick, you'll slip each paint stick through the binder ring. And just like that, you have created your very own paint stick library that cost you next to nothing. 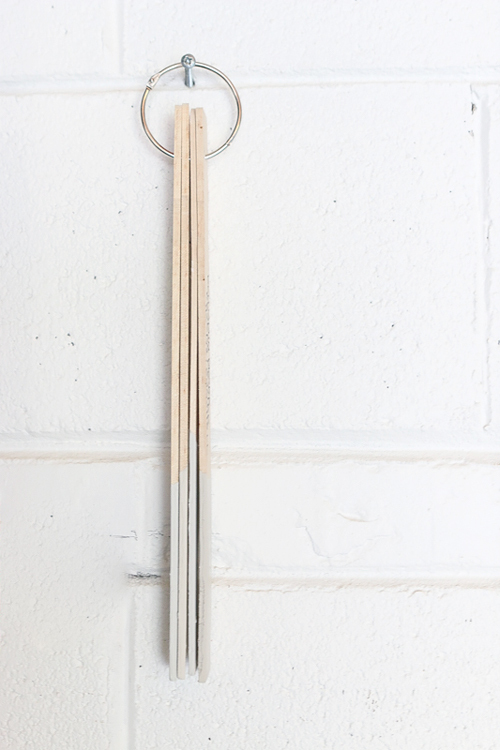 We hung our paint stick library in the garage so we can quickly & easily access it. However this library can stay in a drawer, hang on a hook inside a cabinet or closet, or even be stacked on top of your leftover paint cans. 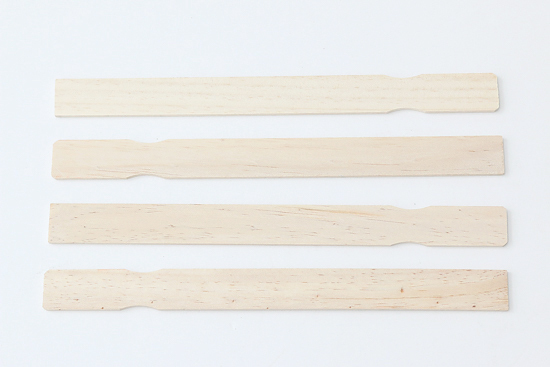 The best part of this simple paint stick library is that you can also add more paint sticks to this collection as your paint collection grows. Paint a room in your home a new color and you can easily create a new paint stick and add it to the bunch... without much effort at all. If you want an even EASIER version of this same concept, you can create a paint stick library using paint swatches instead of paint sticks... a paint swatch library. 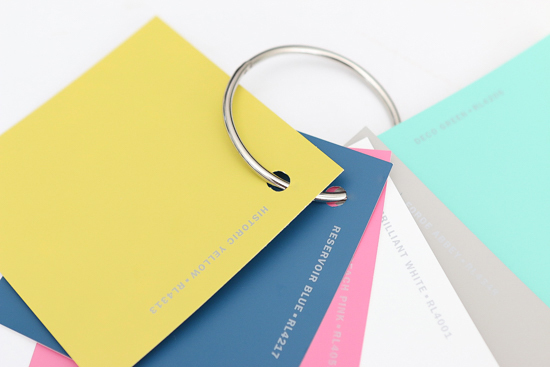 Simply collect a free paint swatch for each color paint you used in your home, punch a hole in the corner of each swatch, and bind them together with that same handy-dandy binder clip! 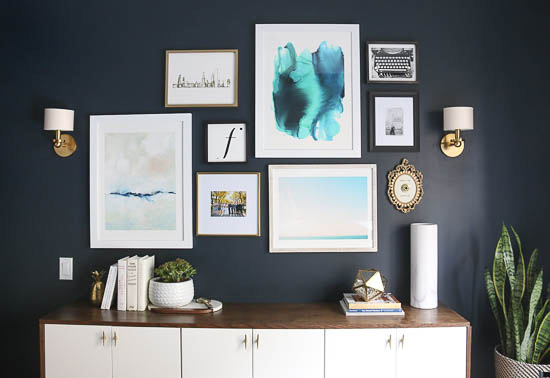 Now this last strategy for remembering and organizing your home's paint information is perfect for those people who don't necessarily need a tangible item to refer back to, but instead would rather keep this information saved via technology. And just like those last strategies, this one is very inexpensive.... FREE if we're really keeping track. 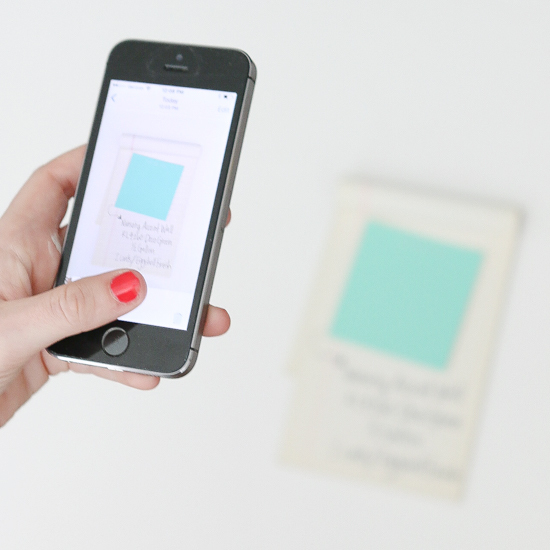 If you're not the person who needs to see/touch/hold/manipulate an actual paint swatch, then storing this information on your phone is a great way to make sure you always have it with you and always know where it is. 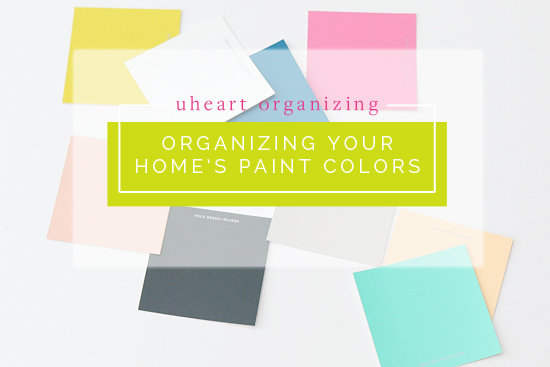 Granted, the true colors of the paint may be a bit skewed depending on the camera quality of your phone, but this technique is the perfect way to cut-down on clutter while still staying organized and informed. Just like you did with the paint swatch library, you're going to collect a paint swatch for each of the paint colors in your home. For each color, you're going to lay it on a piece of paper and write down all of the facts that you need to know about this color. Then, instead of creating a tangible item with this information, we took a picture of the swatch and notes. Rookie Tip: It's important to use a dark marker when writing this information on the paper. This helped us see the font very clearly in the cell phone photos. From there, you can save each paint photo to whatever venue works best for you and your lifestyle. Maybe you save each photo in Google Drive, maybe to a specific photo album on your phone, maybe on Dropbox or maybe as an email attachment. As we all know, the techy possibilities are endless! Regardless of where you choose to store these images, we hope you keep these photos in a place that is safe and will be quick and easy for you to find. 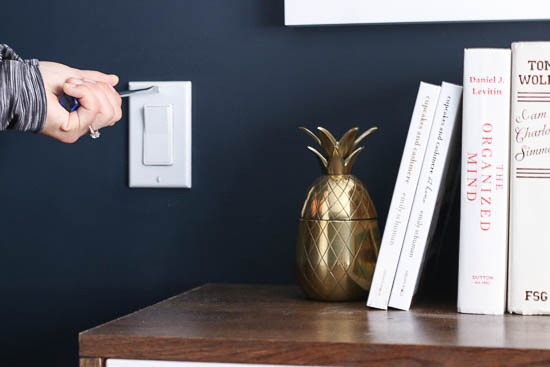 If you're tech savvy, we love this simple idea because you'll ALWAYS have your paint information with you and will not have to store anymore "stuff" around your house. 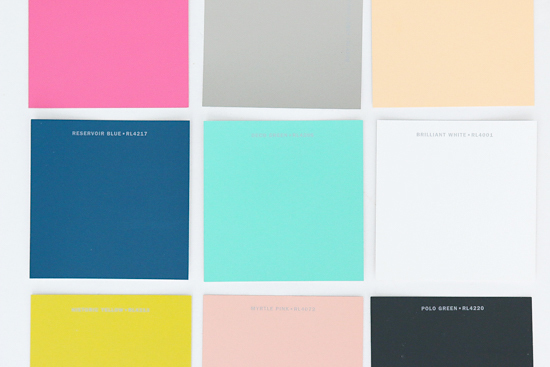 So are you ready to get your home's paint colors organized?! With minimal time, effort, and money, you can make sure that you never ever forget the colors you meticulously chose for your home's walls. I used pinterest to organize my paint colors... I just created a secret board where I pinned all of my house paint colors with the important info. It took me only a few minutes and it's easy to find! GENIUS! Love that idea, thanks for sharing!! 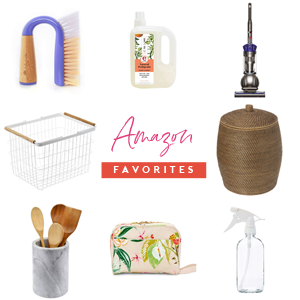 Thanks for the tips and the new blog to follow! 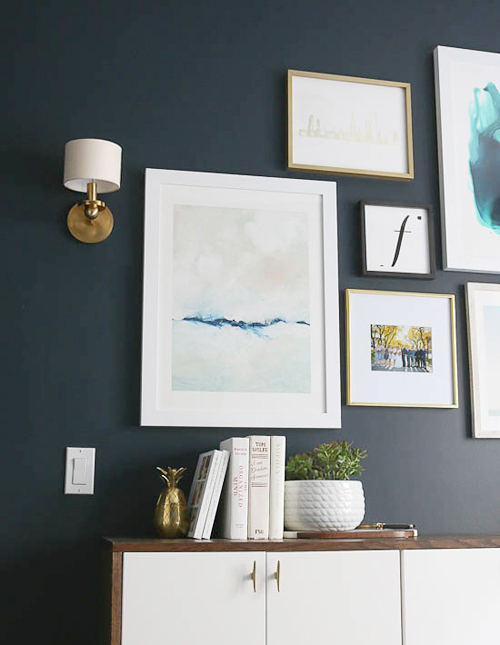 Just want to mention that I did something similar to this a few years ago but when I went to the Benjamin Moore store I was told, "You don't have enough information to match what you previously had. I need more than the color number. I need to know which base was used when it was made." So FYI, there are a lot more numbers and info. on the can than the color number and finish type. As in all that information at the bottom of the can. That's why I took photos of the actual can and the mixing info printed on the label when purchased. I added all that to my secret board on Pinterest. Also remember to actually have a real sample of the paint somewhere. I went after 2 years to the store to get more and they had discontinued the actual base mix so I had to color match it. Luckily I had an actual sample to make that easier. Those are all great ideas, thanks. So far, we've only remembered to save my son's bedroom paint color and we just saved the paint swatch on a shelf in his closet. I like the idea of writing it on the back of the switch plate cover. I always ask for an extra label when they print off the formula for the paint can to keep with my paint chips. Sticking the extra label on the back of the stiring stick would be ideal. Very good ideas! 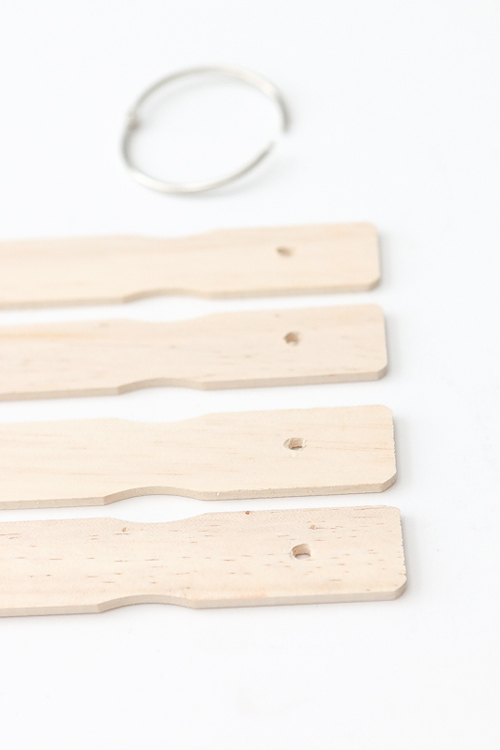 While the crafter in me really wants to do the paint stick organizer, I love the idea of using your phone. Right now I have my paint chips on an o ring which I like for shopping and coordinating purposes. Thanks for sharing your great ideas! Very good idea. I used to work in property management and I would simply add to keep the information on the paint can lid. Write down the codes and even the base type. Make sure you write light, medium or deep base. In a hurry you could easily grab the wrong kind when purchasing more down the road. I say the paint codes also because color names are often discontinued and once they remove them from the system, they can't pull it up anymore. If you have the code, you can still have it made.